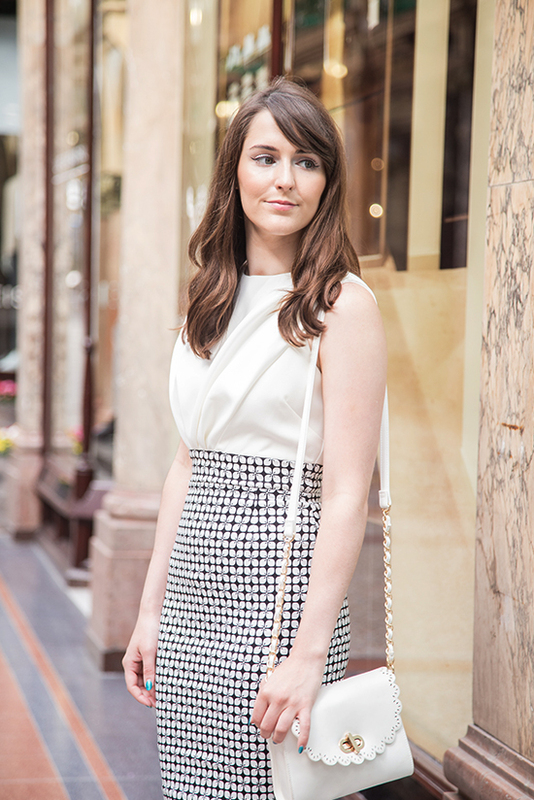 Heading out straight after work with no time to change doesn't have to entail an outfit crisis. It's all about finding those smart work appropriate pieces that can be dressed up instantly with a good pair of heels.. I'm a sucker for a fitted pencil dress for this type of occasion, which is why I've recently become such a huuuge fan of Vesper! They actually have a desk to dinner range which is perfect for wearing in the office then heading out for a meal or a few drinks in town. 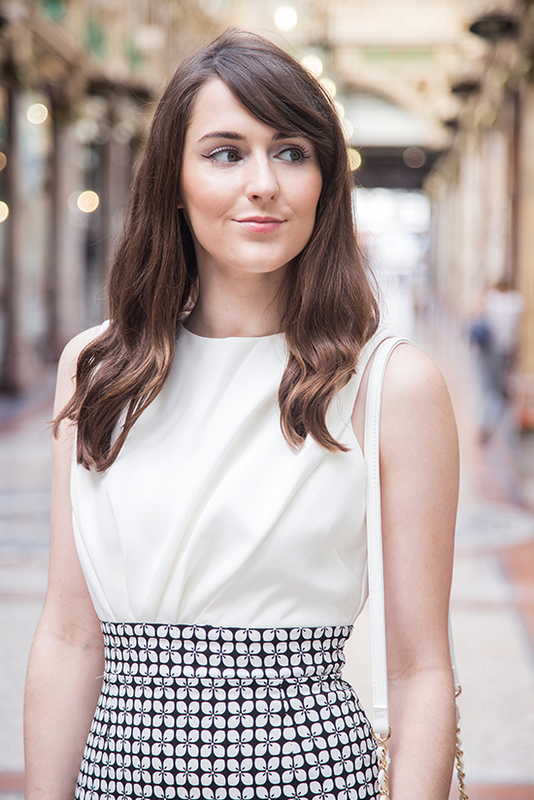 I absolutely love the vintage classic feel of their pieces - in fact their dresses are slowing starting to take over my wardrobe! It's no surprise then that when they got in touch about a collaboration on their most recent range, I jumped at the chance to work with them. 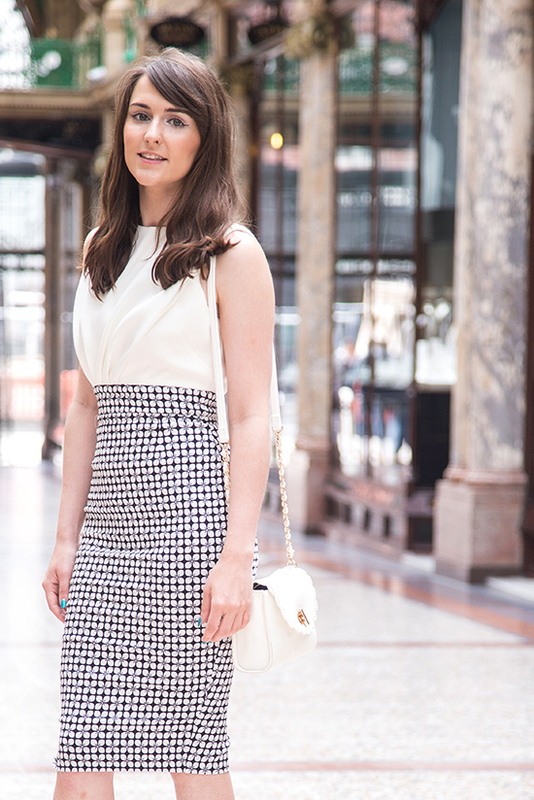 Here's how I styled my Vesper dress in a shoot in the stunning Victoria Quarter Leeds, plus I have a few work wear wardrobe tips to share with you after. 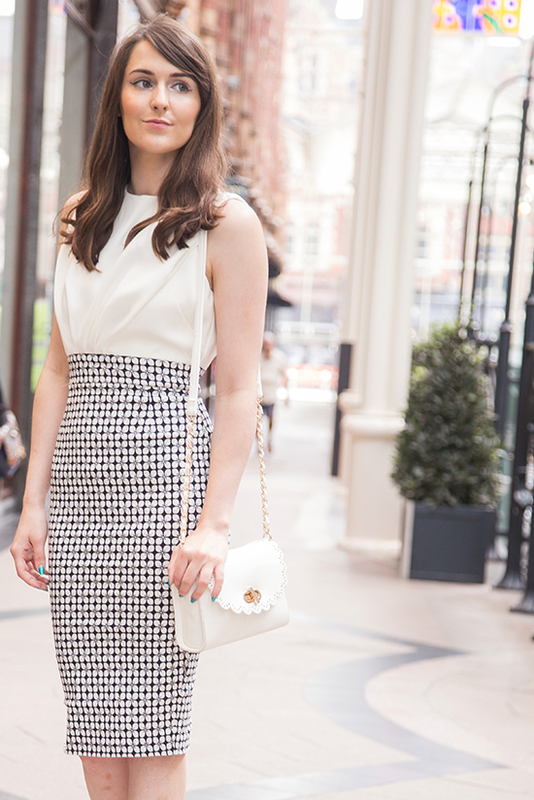 Dress: £54 Vesper - Find here. Navy Heels: £24.99 New Look - Find here. Bag: £15 Asos (bought a while ago) - Find it in black here. I personally find that a good outfit does wonders for my day - if I turn up to work feeling smartly dressed then I feel I get my thinking head on straight away. But if I've got up late and had to throw something together quickly which has all gone a bit frumpy, then I just don't feel as ready for action. PENCIL SKIRTS - These babies are everything! Get them in a variety of colours and even some patterned and you'll be easily throwing outfits together. PRINTED/BOLD SHIRTS - Especially good for the pencil skirts or for wearing underneath dresses. There's the obvious white shirt but try a variety of bold colours to brighten up your look like yellow/mustard, blue, purple etc. The less baggy the better as you want them to fit nicely (some shirts these days you think they'd want you to wear them as a dress!). WAIST BELTS - A good selection of brown and black waist belts are essential and a great addition to a pencil skirt & shirt outfits. FITTED DRESSES - Get them in various different colours then you can wear them on their own or layered up with shirts underneath or cropped jackets over the top. 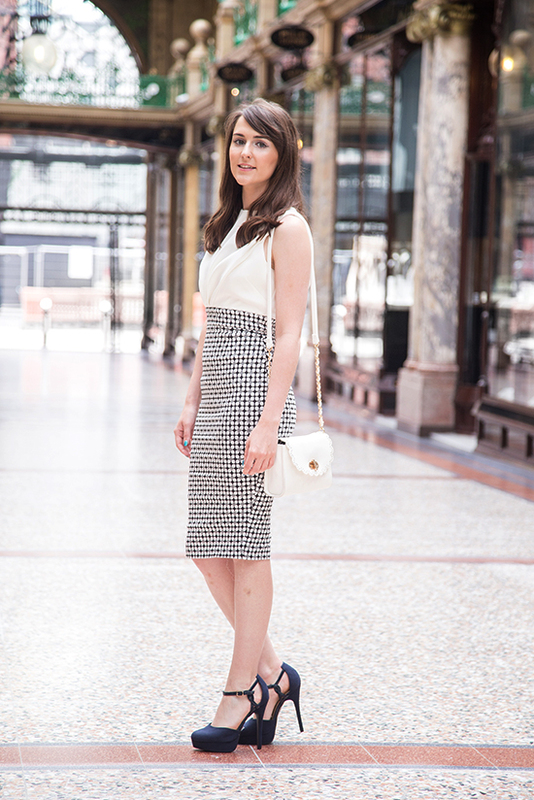 HEELS - If you can't go full heel then invest in a few pairs of comfy midi heels (pu**ies). Black is an obvious starting point but navy goes with a lot too or a lighter colored tan pair work well. And that's all for my work wardrobe essentials - huuuge thanks to Vesper for sending me the lovely dress to review. 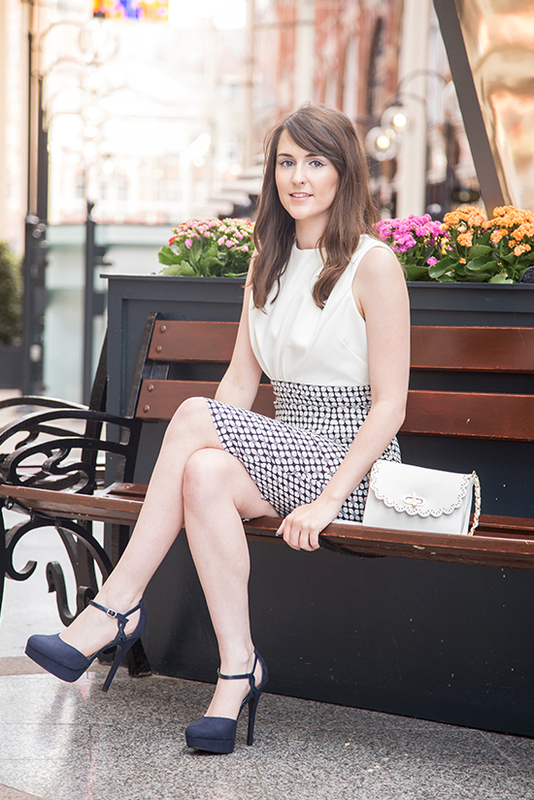 You can find more of my work wear styles over on my instagram if you fancy :) Also thanks to camera extraordinaire Matt for another great shoot in Victoria Quarter! Thanks for reading - what's your go-to work style? 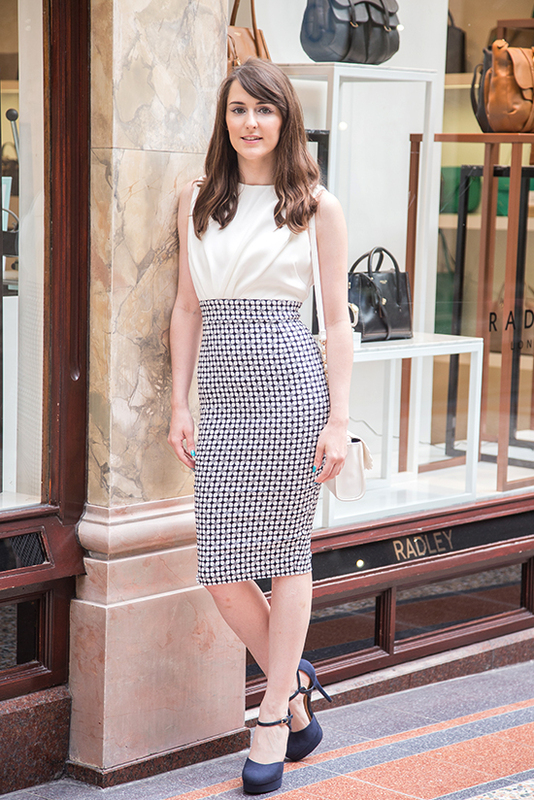 You look so stunning in classy workwear Gabby! That dress is so beautiful! You've styled it perfectly as well!